The story of Ellen Johnson Sirleaf, leader of the Liberian women’s movement, winner of the Nobel Peace Prize, and the first democratically elected female president in African history. ...[an] expansive and penetrating narrative of a country, Liberia, that sweeps across continents and time ... Cooper, a New York Times Pentagon correspondent who was born in Liberia and won a Pulitzer Prize for her coverage of the Ebola crisis there, writes vividly and with authority. 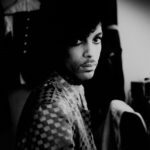 In the book’s closing chapters she captures the poignant — and sometimes difficult to read — tales of mothers dying because they had cared for their sick children, and adult children contracting Ebola as they cared for their mothers ... impressive for both its detail and the insight it provides into a historic figure. Throughout, she offers an unflinching look at the reserved Sirleaf’s personal life and presidency, which comes to an end this year, while also telling of Liberia’s pain and pride. 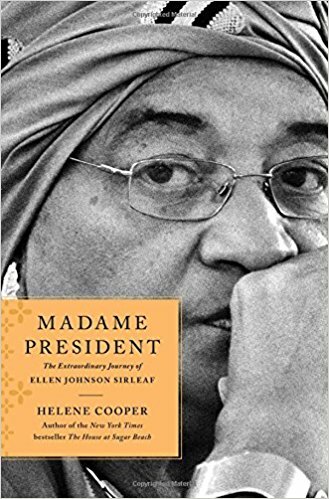 In Madame President, the journey of Liberian leader Ellen Johnson Sirleaf unspools like a novel, fitting for a life that is nothing short of mythic ... It's filled with details that emerge from dogged reporting as well as an intimate understanding of Liberia's complexity and culture, which perhaps could come only from being a native daughter ... Cooper's prose, witty, blunt and peppered with the Pidgin English spoken by the peoples of Liberia, immerses the reader in the fabric of that small, West African country ... Madame President is a fascinating read to enlighten those who may know little about this woman and the nation she leads, and who will undoubtedly be left wanting to know much more. Cooper restores the texture of Liberia to Johnson Sirleaf’s life story, making this a propulsive biography, but it ultimately feels subservient to its subject — valorizing Johnson Sirleaf rather than complicating her ... in her study of leadership, Cooper takes a deeply American approach. Here, politics is all protagonist, and history is largely a series of plot points. Our hero forges her character in the fires of dictatorship and war. The narrative is a linear march, with little time for distractions ... Cooper seems to take Johnson Sirleaf’s point of view as a structural blueprint, supplementing the president’s memoir with interviews she conducted with her ... one wishes that Johnson Sirleaf’s biographer would reckon directly with the president’s responsibility for her more expedient choices, rather than depicting her as a victim of circumstance ... Such a story may be moving, but it’s also a myth. What did you think of Madame President: The Extraordinary Journey of Ellen Johnson Sirleaf?